Can we talk about food today? 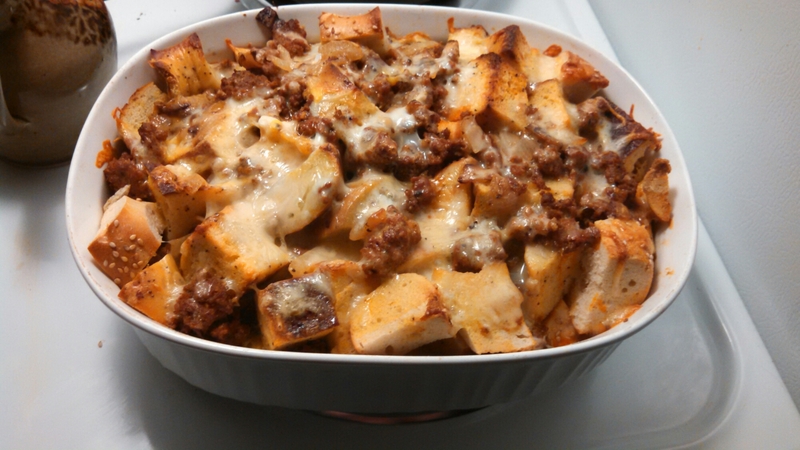 It feels like AGES since I’ve posted about …well anything, but specifically food! So today, how about a recipe? This is great for company because you can make it ahead of time. And it involves bagels… So you really can’t go wrong, in my opinion. I know Thanksgiving is tomorrow… But this is more of a Black Friday/Small Business Saturday recipe…. Farmer Ben and I were shopping last week and our grocery store was having an insane sale for a random ten minutes… 6 bagels for $1!!!!! It was such a good sale that we bought a dozen. Is there even a question on whether or not one should buy bagels when they are less than 17 cents each? I didn’t think so. Anyway, we ended up giving ½ dozen to Ben’s dad and step-mom who are in town visiting and had bagels for breakfast one morning… and then I had people over on Saturday and needed counter space, so I moved them to the top of the fridge and promptly forgot about them until yesterday. Needless to say, they were starting to get a little hard. Now, if you know me, I HATE wasting food. So I perused our cookbook collection to see if I could find a way to use them up. Farmer Ben said he would use them in stuffing, but I had a better idea. Bagel Pudding. I love traditional bread pudding…but I also love breakfast. Savory breakfast…I’ve been eating a lot of sweet stuff lately and we had all of these delicious garlic/onion/sesame bagels to use up. 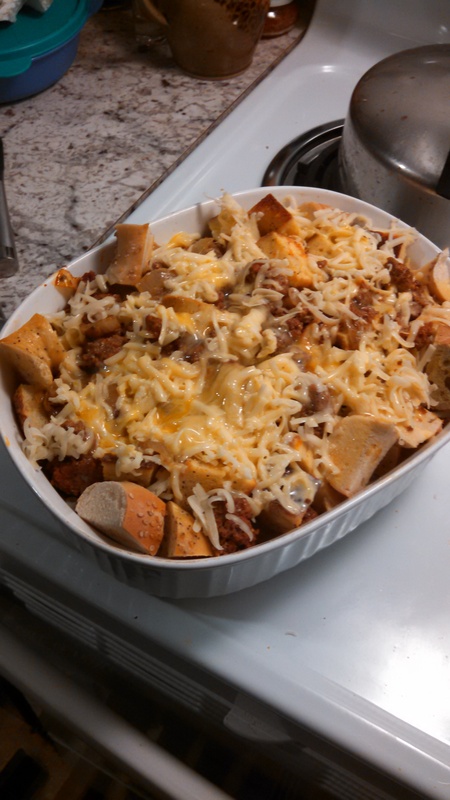 I’ve also been on a major casserole kick lately, so this was a perfect way to keep that rolling…not to mention, it is stupid easy to make! This is slightly adapted from the Pioneer Woman’s Breakfast Bread Pudding (from her cookbook). 4 savory/salty bagels that are a couple of days old. Cut bagels into chunks (I cut mine 4 ways both directions, no need to slice) and set aside. Place 2 tbsp. butter in a large skillet over medium heat. Once melted, add in your onions. Cook until nice and soft (I caramelized mine because Ben’s a weirdo and only likes disintegrated onions, but as long as they are pretty well cooked, that will also work). Remove onions from skillet, placing into a small bowl, and set aside. Put sausage into the same pan, breaking up as you cook it. Let brown. Remove from heat. If you have a lot of grease, drain it (this will depend on your sausage). While your sausage is cooking, whisk together your eggs, cream and spices in a large bowl. I went very light on salt as the chorizo and bagels I used were pretty well flavored, but again, this is to your taste. Grease a 2 ½ qt casserole dish with remaining butter. Layer half of your bagel pieces in the dish. Add half of your sausage and onions. Top with half of your cheese. Repeat bagel, sausage, onion and cheese layers. Pour your egg mixture over dry ingredients. This part is a little scary, but it will fit! Cover with foil and refrigerate overnight/for a few hours. The next day… pre-heat oven to 350 (you’ll want to take your casserole out of the fridge so it warms up as well). Once pre-heated , place casserole in the oven, still covered. Bake for 20 minutes. Remove foil and bake another 20-25 minutes or until cheese is melted, and casserole is firm and crispy. Eat immediately. This will also reheat well. Happy Thanksgiving, Shopping and Long Weekend, Friends! Cheers! Last week, the hubby and I barely saw each other (Other than Monday when we were in Boston). I ended up working both jobs and doing a lot of running around most days, so I was home to sleep…and that’s pretty much it. Needless to say, we were looking forward to our day (much-needed!) day of rest on Sunday. We hadn’t been to Burlington in forever so we decided to take a day trip across the lake. We both needed a good day off. So, off to Burlington we went…..
White-Legged Kicking Back in the passenger seat…..
A Draw Bridge…waiting for the boaters. One of our favorite places to eat… note the page numbers of the beverage list! Burlington Landmark, Al’s French Fries. My first visit… I don’t know what they use for hamburger buns…but OMG-SO GOOD. Two Running Shoe stores and my awesome new Mizunos! Artisan Olive Oil and Vinegar sampling at the Saratoga Olive Oil Co.
Wally’s Bagels Delicious Bagels made on-site in VT. THE BEST! Sharing a glass of Spanish Red and watching a cheesy sci-fi flick to unwind–at home! Gasp! Phew! What a great day! What did you do this weekend? Have you ever had a messy explosion/spill in your car?